Improve your pet's emotional, physical, and spiritual well-being—and strengthen the bond between the two of you in the process—using vibrational medicine and energy techniques. Bestselling author Cyndi Dale's remarkable guide covers the chakras and subtle energy system for a variety of animals, from mammals to invertebrates. You'll explore the foundational energetics of common problems and learn how to assist your pet, no matter what the issue. Using intuitive communication and energetic assessments, you can fully support your pet's development in every stage of life. Explore the use of essential oils, stones, and homeopathy to promote healing. Discover your pet's energetic signature to better understand his or her personality and needs. 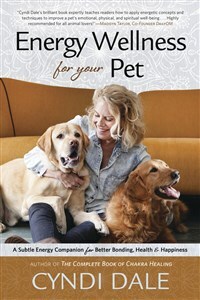 This indispensable book helps you create a happier, more loving relationship with your beloved animal and discover more of your true self along the way. Includes 12 pages of full-color illustrations. Cyndi Dale (Minneapolis, MN) is an internationally renowned author, speaker, healer, and business consultant. She is president of Life Systems Services, through which she has conducted over 65,000 client sessions and presented training classes throughout Europe, Asia, and the Americas.